If you would like a quote please fill out the questionnaire and send it in to - info (at) galenlabsupplies.com. 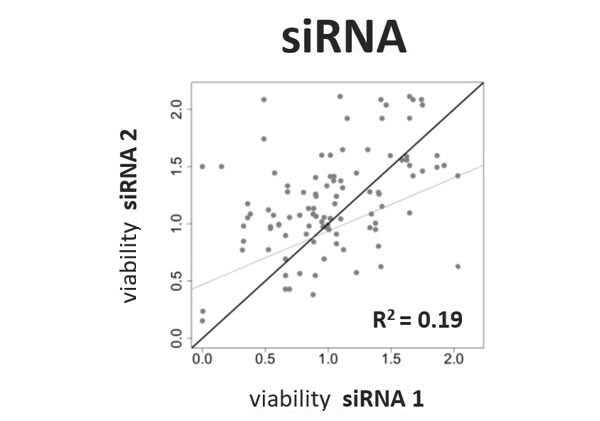 Individual siRNAs or low complexity siRNA pools containing 3-4 siRNAs often hit multiple off-target genes and exhibit variable target gene knock-down. 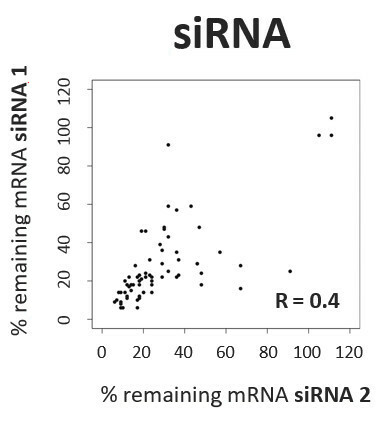 dilutes the off-target signature of each siRNA, increasing on-target specificity. ensures co-operative knock-down of the target gene, producing more robust and reliable results. Specific reagents should only affect their target. 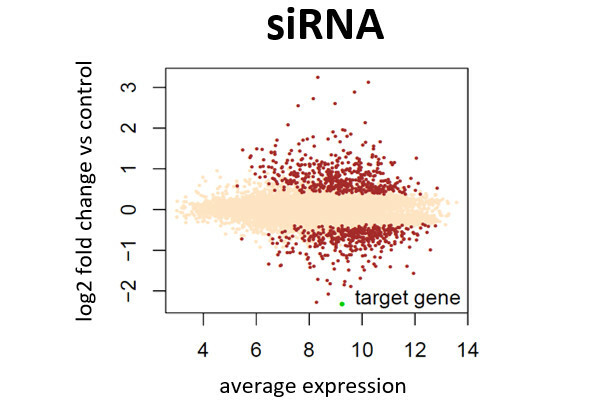 Expression profiling by microarray in HeLa cells revealed a single siRNA can induce numerous off-target genes (red dots) while a siPOOL against the same target gene (green dot), and containing the non-specific siRNA, had greatly reduced off-target effects. 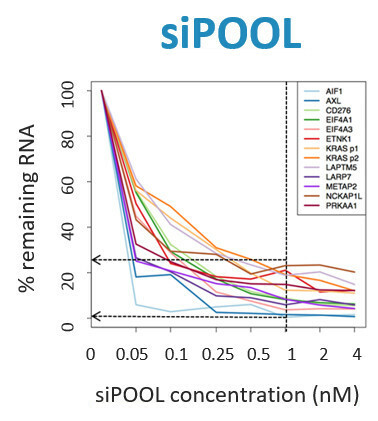 siRNAs vary strongly in their knock-down efficiency. 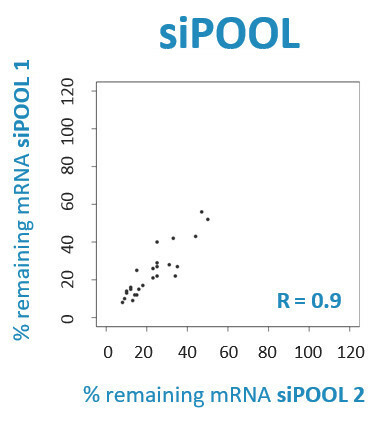 siPOOLs against the same gene gave similar knock-down efficiencies compared to single siRNAs, indicating greater robustness and reproducibility (left and middle panel: correlation plots of real-time quantitative PCR measurements of target RNA levels). 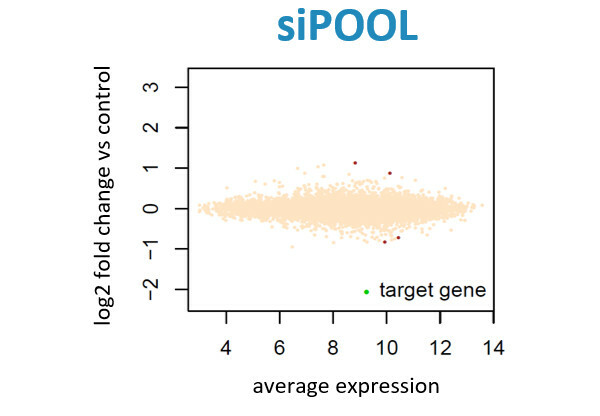 siPOOLs also exhibit potent gene knock-down. In commonly used cell lines, gene knock-down efficiencies of 75-98% are often achieved at 1 nM concentrations for many genes (right panel). If reliable and specific, two reagents that target the same gene should produce similar phenotypes. 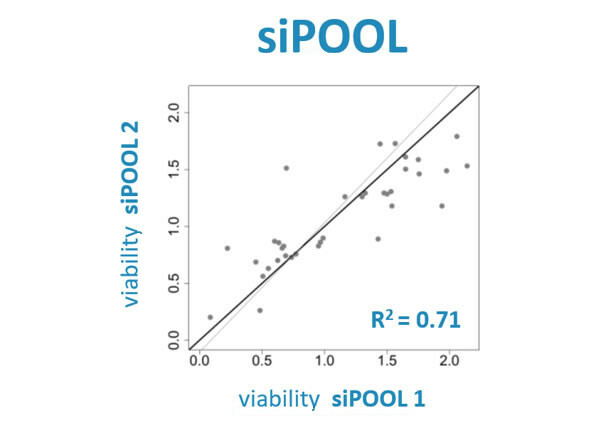 We screened 36 genes using two siPOOLs per gene from our human kinase siPOOL library and three siRNAs per gene from a commercially available library and measured cell viability in A549 cells. Only siPOOLs produced consistent phenotypes. Customized design using latest annotations.